Tried another new place with Calvin during the weekend again :) BBQ Plaza will be one and only place that I dine in at 1U!! Always!!! Decided to try something new with him, so we stood at the directory for a really really long time. Before that, we wanted to settle with Delicious but it's kind of warm in the restaurant, so we made a U turn and went to the directory instead. Our first choice was Chili's since both of us never try that place before. But we were told that there's a waiting list and we have to wait for like 20 minutes. We're watching The Proposal that day and there's not much time left. So Chili's will have to wait for some other time k? Hehe. Anyway, he suggested that we just enter whatever restaurant that's near to where we are and just eat there. Sounds good to me :) but the bad thing is there's not much restaurants at that area. Hehe. Then from far, we saw Jack's Place and both of us never try this place before. So we just went straight in without looking at the menu first. It's kind of scary at first because from the entrance, we can't see any customer dining in the restaurant. We thought it was closed :) But when we walked further in, we're relieved that they were actually nearly full that night. Both of us ordered set dinner and I reminded him about the Fish from Hell. Haha. That's because he ordered the set with 2 different type of fishes :) But for me, as long as there's dory fish, it should be okay. I mean, no one can go wrong with Dory fish okay. It's the most safe fish to order in the world okay!!! Haha. Our smiley green BEAN soup. Imagine my horror when I'm halfway with the soup and then I decided to ask the waiter what soup is it and he told me it's Green BEAN soup. My heart nearly stop. At first we thought it's vege soup or something like that because it's green in colour. The thought of green bean .... ewwww..... Anyway, I'm halfway through the soup. So there's nothing that can be done. 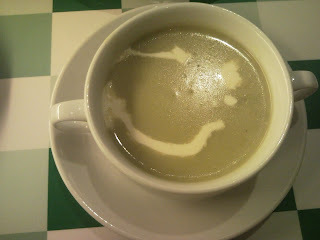 But once I knew it's green BEAN soup, I stopped drinking it at that very moment. It's really disgusting. I thought there's only green bean tong sui but green bean soup is a bit ... over!! Who came out with the idea anyway?? Calvin's fish from heaven. Haha. Look at the colour and compare it with the one from previous post. I'm sure that you will agree that it's fish from heaven right? Hehe. Anyway, the salmon is not really nice though. Dory, as usual, was really good. 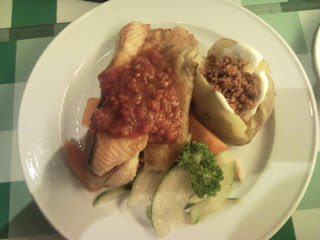 I think the red gravy on top is a combination of tomato paste with sambal. Serious. SAMBAL! There are a few dishes in the menu that have Sambal gravy. This is my shrimp and chicken combo. The shrimps, well, I must say my mum's fried shrimps are the best okay. I am dead serious. This one tasted like.... normal friend shrimps. There are no oh-la-la moment or anything close. Just. Nomal. Like that :) Hehe. But I love the potato. The amount of sour cream was just nice for me to enjoy the whole potato. 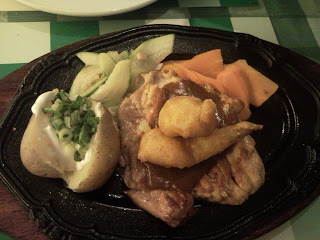 As usual, I finished the potato and cucumber first before enjoying the shrimp and chicken. Hehe. 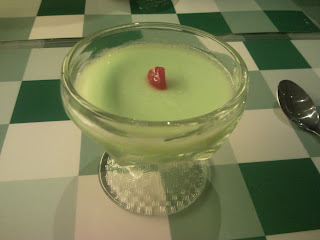 Our dessert :) It's honey dew pudding. I thought honey dew is suppose to be orange in colour but apparently I'm wrong. Totally wrong. The pudding was quite nice though. I'm not a big fan of pudding because they always have this ... funny-sandy taste to it. Calvin found it funny when I told him I don't eat cherry because it tasted like an empty cupboard. I'm serious. It really tastes like an empty cupboard. Really..... disgusting. The Pink Sage = Best Breakfast! !